What could feel more exclusive than the blissful isolation of Bodmin Moor accompanied by one of the snuggest glamping abodes we've ever come across? Inside an ingeniously converted shipping container, a stylish, modern space is fitted with a double bed – covered with crisp, comfortable sheets – alongside a small kitchenette with everything you need and 'ensuite' facilities just outside. Reached via a long, remote track flanked by heather and wild flowers, this is a truly exceptional hideaway for two with no one else for miles. And, of course, if the name doesn't give it away, you also have your own staggeringly beautiful lake on the doorstep. It's all just for you. The stately grounds of the grand Mere Hall set the scene perfectly for a weekend of glamping relaxation. With the sights and sounds of wildlife filling the reinvigorating country air, the centrepiece of this idyll is undoubtedly the farm’s tranquil lake. Onsite there are just two beautifully crafted Mongolian yurts, each kitted out with serious comfort in mind. The wood-burning stove turns this into a cosy nest of loveliness while the air vent prevents things from getting too stuffy. The surrounding smallholding is home to a whole host of convivial critters including sheep, cows, geese and llamas. In the north of Snowdonia National Park this cosy shepherd's hut site offers not one but two huts per booking, with a living and sleeping area inside the first and a bathroom and sauna in the second. The result is more space but the same exceptional seclusion, shielded away in a small copse of trees. Positioned above a bubbling stream – great for an invigorating, post-sauna dip for the adventurous – the huts are half a mile from the road, along a farm track, so peace (and wildlife) is guaranteed. Book from 13th–16th February and they'll even throw in a box of homemade jammy dodgers and a bottle of Prosecco! At the southern end of 19-mile long Arran in Western Scotland, Runach Arainn is a brand new glamping enterprise opening this Christmas. On the banks of Kilmory Water and within the grounds of an 17th-century rectory, just two yurts are found, each with a private bathroom. They do, in fact, sleep up to six people each, but work nicely as a romantic break for couples, with a deep, double bed alongside futons that work as comfortable sofas. In harsher weather, the likes of a toasty wood-burning stove and a hefty stack of logs allow you to create your own cosy cocoon, while the circular crown at the top of the yurt lets you peep out at the constellations above. 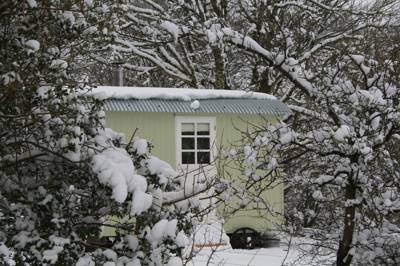 This single shepherd's hut on a working farm is arguably even better in winter time than in summer. With the neighbouring PYO strawberry farm quiet over the colder months and the local pubs all stoking up their open fires, the site becomes a truly romantic hideaway in a peaceful part of the world. Explore the board-walks of Essex's tidal marshes, rich in wetland birdlife, or stay around the hut to discover a fully restored wooden water mill, built in 1831, and an array of beautiful ponds. Inside there's a built in, king-sized bed, a kitchenette and a wood-burning stove, plus underfloor heating throughout. It has en-suite facilities too, with everything right down to botanical toiletries provided.